Arab traders first arrived in the 1830's, with British explorers following in the 1860's, and Uganda became a British protectorate in 1894. The Protectorate gained a British Blue Ensign as its flag, with a disc placed on the flay. In the disc, a Grey Crowned Crane, the national animal of Uganda. 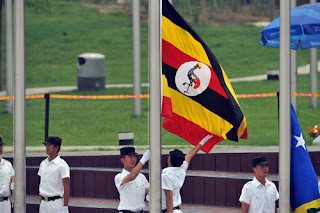 In March 1962, Uganda adopted a new flag, a vertical tricolour of green, blue, and green. However, to follow the rules of tincture, the green and blue stripes where divided with a thin stripe of yellow. In the central blue stripe, Uganda placed a large yellow version of the Grey Crowned Crane. However, upon independence, in October 1962, they switched to another flag. This time, using 6 horizontal stripes, of black, yellow and red, repeating. In the centre is a white disc. Upon which, a Grey Crowned Crane. 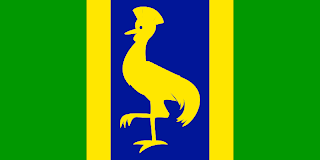 An emblem that has been used by Uganda for a long time, on flags, and on other state emblems. The black represents the the African people, the yellow represents the sun that shines over Africa, and the red represents the unity and brotherhood of the peoples of Africa. The flag has remained the same ever since independence. From monarchy, to republic, to dictatorship, with the brutal governance of Idi Amin. Back to democracy again. Though, how democratic Uganda is today, is open to debate!